Tough enough for any busy classroom, the durable Yoga 11e boasts powerful processing and an all-day battery. It can also be used as a tablet, laptop, or anything in between. And built with post-consumer recycled material, it's a smart, green choice for students and teachers. A rubber bumper around the top cover absorbs the force of side bumps. And the corners are 50% stronger to reduce potential damage if dropped at an angle. In fact, it can withstand drops from up to 90 cm. 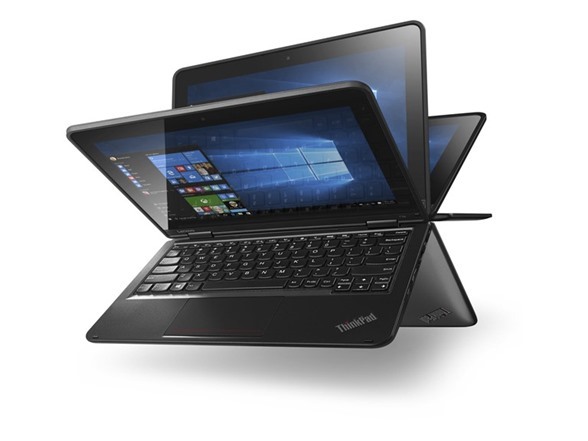 From hinges to ports, we’ve thought through every detail on how to make the Yoga 11e one tough, durable laptop. Military-specification testing validates the ruggedness, durability, and quality of this machine. Before it gets to you, the Yoga 11e has to pass the most rigorous tests and procedures, including high pressure, humidity, vibration, temperature shock, fungus, and dust. It's then ready for everything - from the classroom to the great outdoors. With up to 11.5 hours of battery life, you won’t have to worry about scrambling for a charger in the middle of class. 11.81" x 8.27" x 0.90"